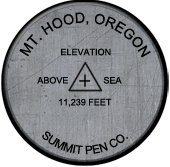 Mountaineering and pen collecting may seem like unlikely passions, but the reality is they are closely aligned. Many pen collectors share a reverence for the written word, and although digital cameras are now part of every climber's gear, it is the written word, from mountaineering classics such as Maurice Herzog's Annapurna or stories of American mountaineering heroism like the first attempts of K2 to tales of modern mountaineers. These feats of achievement and hardship stir our imaginations as we dream of testing our own resolve. Then we turn to guidebooks and trip reports for the information we will need for our own attempt at a summit. Regardless of how much technology we acquire or utilize for training and on the climb, we still hare many things in common with the early ascendants of these and other mountains. At some point we all still get stuck in a tent during a storm, are forced to turn around because of weather when we are so close to the summit and suffer the weight of a heavy pack. While a photo showcases the beauty and challenges mountains offer, they can't relay the crack of a solid ice tool placement, the rumbling of a glacier, the constant snapping of the tent on a window night or the multitude of feelings we have over the course of any climb. These emotions, ranging from excitement to trepidation, elation to disappointment and sometimes even fear, drive us upward and make us yearn for another climb, another mountain, another adventure. We hope you use your Summit Pen Company pen to write your own story, whether it be your trip report of a summit or the inspiration you gain from gazing upon these majestic mountains. 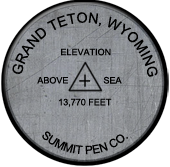 Although no pen can replace the feel of an ice axe secure in your grip as you move up a steep snow slope, we are confident that you will enjoy your Summit Pen Company just as much.